BOTANY POND DUCK UPDATE: James and Honey aren’t in the pond today. I don’t know if they’ll return, as they may be scoping out the staging area to see if other ducks have taken off again. But I’m heartened that, unlike several days ago, they left together, and I’m hoping they’ll travel together till next spring. Because it’s a coral island without free-standing water, there are no ponds, and Trevor was stranded high and dry. He eventually found a small puddle, and sticks to it closely, though it’s not nearly big enough for a duck. Moreover, there’s no food for Trevor. The locals started feeding him bread, but quickly realized that Trevor needs better noms. Now the locals not only bring him good food like bok choy, but carry buckets of water to fill up the puddle as it dries out. Even the local fire department has volunteered to keep Trevor’s puddle going. Still, it’s a lonely life, and Trevor’s now being harassed by a ROOSTER, for crying out loud. 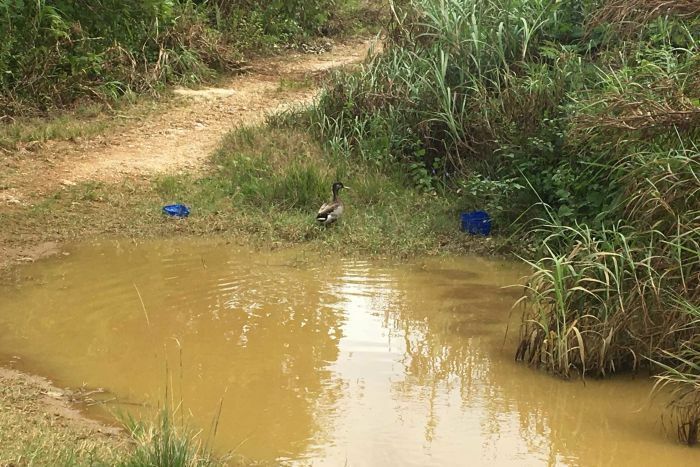 Niue is a coral atoll without wetlands or ponds, so this duck has had to make do with a large puddle. No one knows where it came from, or quite how it got there — and for that very reason it has become somewhat of a celebrity. 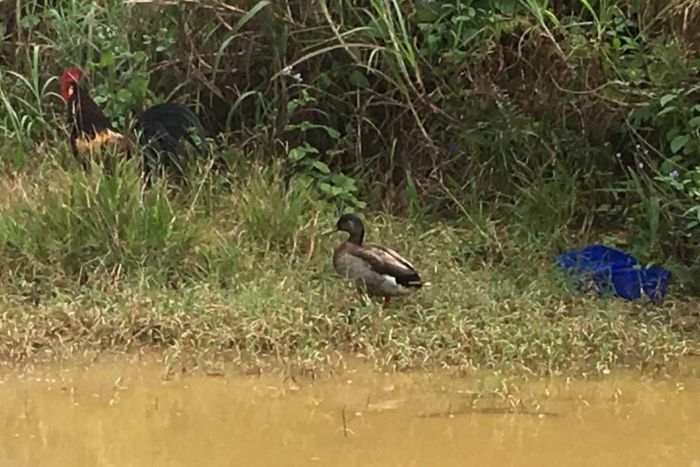 “Everybody knows about the duck,” said Randall Haines, who has lived on Niue for several years. “We drive into town every few days and you can’t help yourself, you just sort of look over and see if it’s still in the puddle, and it is. “Someone said, ‘Turn right past the duck’ and then the whole story came out, the only duck on Niue,” she said. The duck — which appeared earlier this year — is widely known as “Trevor”, after New Zealand’s speaker of the House of Representatives, Trevor Mallard. 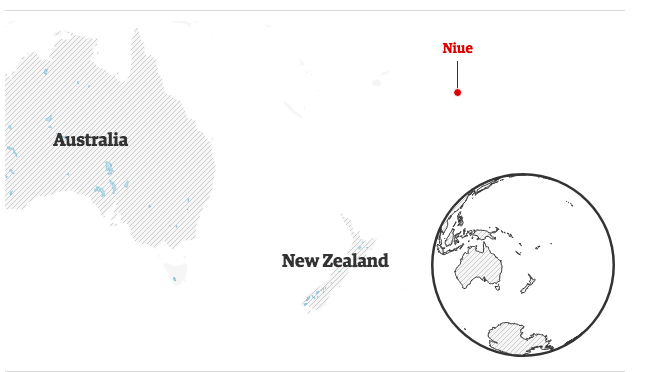 Niue is a self-governing state, but Niueans are citizens of New Zealand. Despite its isolation it is not short of food. Trevett said it was being fed by locals, including offcuts of bok choy from the former New Zealand high commissioner. The fire service has also been topping up its puddle. How did the drake get to Niue? The theories, which are not mine, are that he stowed away on a ship (unlikely) or flew there (not all that likely, but more likely). Poor lonely duck! I’m hoping that Jacinda Ardern, New Zealand’s Prime Minister, will take pity on Trevor and have him moved to the main islands of New Zealand, where he can swim to his heart’s content and also find a mate. That would be in keeping with the animal-loving nature of my second homeland. Here’s an 8-minute show about Trevor from Radio New Zealand (click on the screenshot). Heartbreaking! This entry was written by whyevolutionistrue and posted on September 25, 2018 at 2:45 pm and filed under Caturday felids. Bookmark the permalink. Follow any comments here with the RSS feed for this post. Both comments and trackbacks are currently closed. About half the time you wrote “James” rather than “Trevor”. Oh dear; I’ll fix that. It is interesting how Trevor arrived there and how an island like this can self select what will survive. Please don’t “fix” that — it reveals your humanity. I’m fascinated by the comings and goings of your ducks, as a group our local ones seem to be a constant set right now (I guess if they switched out I wouldn’t notice). Perhaps because it’s a larger group. Yesterday evening there was a large committee meeting of mallards in our backyard, I counted 68 of them between us and next door, plus those on the water (but may well have missed some). I’m not sure what they were discussing but they eventually wandered off across the road to wherever it is they go for the night. They have come to recognize that when they cross as a group the traffic will stop. So they are unhurried in their waddling. OMG 68 mallards: a paradise! THE BETTER ANGELS OF OUR NATURE: are from KiwiLand. Jacinda Ardern makes history by bringing her infant child to the UN assembly in New York. The Kiwi leader, accompanied by her partner Clarke Gayford, brought Neve Te Aroha Ardern Gayford, on Monday to a roomful of international leaders and representatives. Net him already and take him to someplace survivable – birds get blown around, Connecticut got its first Roseatte Spoonbill last week when the hurricane blew it up this way. James Pond [licence to bill] the Botony Pond drake. He’s Honey’s Beau when she isn’t off elsewhere getting her webs re-oranged & nails sharpened [or possibly she’s window shopping for alternate mate material]. He’s lived on the island for several years and seems to be doing well for himself. Enlarge the puddle and import a Mrs. Mallard. That’s good to know. But if mallards are not indigenous to this island, it would make better sense to remove him to a habitat where they already occur. Could Honey be going off to where a bigger flock is, and perhaps they are all building up their flight muscles for the great journey south? Oh, come on. That’s just too good. Much as it would be nice for the PM to help out this duck, it seems like she should probably be doing more important things. Maybe should could just tell an aide to “get someone to do something about that duck.” That would be acceptable. Thank you for the advice that I should not bother the PM about this. It has been duly noted. Surely it isn’t beyond the wit of the Authorities to either put him on a Plane to New Zealand, or dig out a bigger Pond for him. Poor lad.